I heard a few days ago that the lead singer of The Troggs, Reg Presley passed away last week. The Troggs were the group that originally did Wild Thing. But they did better than that. In 1967 they charted with the love song Love Is All Around. 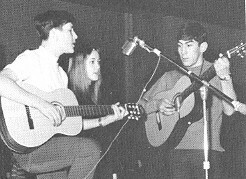 Now in 1967 I was 16 years old and had recently gone from singer in my junior high rock & roll band to playing acoustic guitar. The first guitar I bought with my own money was a Goya G-10 which I bought at GI Joe's pawn shop in downtown Denver. The very first song I played on that guitar to see if it would cut the mustard was Love Is All Around. Forty six years later I still own that Goya and like me it has many weather checks, some bumps and bruises and a few cracks. I tried to find an acoustic version of the Troggs or Reg Presley doing the song but couldn't come up with any. I did find an acoustic version of REM performing the song. So in tribute to Reg Presley and my Goya G-10, here's Love Is All Around.